On Sunday afternoon I went biking with Lotta in the area around Ursvik. It was a lot of fun even though I did crash once. I was riding quickly along a flat part in the trail when suddenly my rear wheel locked up completely. Needless to say, my bike and I came to an abrupt halt. I discovered that the rear wheel had come almost completely lose from the frame. It had come free on the left side, causing the front of the tire to rub against the right chainstay. That's what caused the sudden stop. It could have been worse. The wheel could have come look completely, and it could have happened on a steep downhill section. I was lucky. Next time, I will check the firmness of all vital quick release bolts before embarkation. After the ride in Ursvik, Lotta and I rode along the Southwest side of Brunnsviken to the South end of the lake, where we parted company. I turned around and headed back into Hagaparken, where I tried a few of the trails. I even tried to go up the big hill in the park, but the trail was too steep and sandy. Maybe I'll be able to conquer this hill someday, but not today. 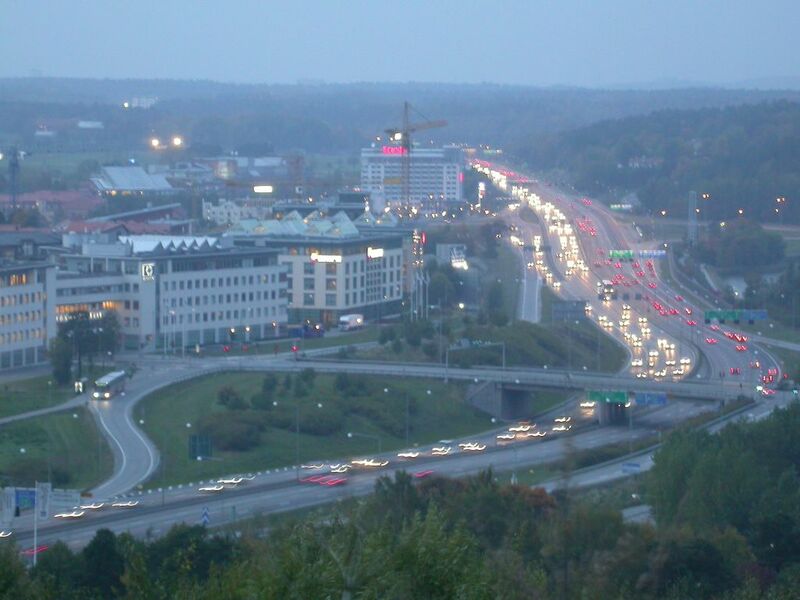 Here's the view of the E4 and Järva Krog area from the top of the hill.